Many of our Holiday Villas are close to Holiday Fun facilities without being in busy tourist areas, so you can sample Cretan life as it really is but with excitement and entertainment never far away. the heart of Beautiful Crete. Low-cost. Outstanding Value! A modern, traditionally-styled and beautifully built one-bedroom holiday house adjoined by Villas Persephone and Alexandra, all sitting amid beautiful gardens and olive trees high on a hill overlooking the bustling city of Chania. See Holiday Fun. Very spacious modern accommodation of a very high standard. A perfect romantic retreat for a couple. Edge of village location but close to big-city facilities. Wonderful mountain and sea views. Five minutes to beaches by car, ten minutes to the dynamic, bustling and cosmopolitan city of Chania and all its excitement - but next to beautiful walks in the hills and valleys, eventually down to the lake and bird sanctuary at Agia. Half price car hire with this house! 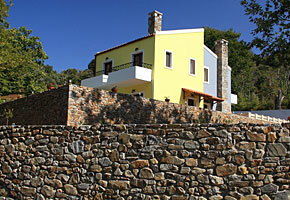 An absolutely authentic Cretan stone village house almost alone in a farming hamlet, high in the hills of Lousakies; 5km above Kissamos to the north and the fabulous beaches of Fallasarna to the west. Built about 150 years ago, the house has 1 bedroom, but room for another person in the spacious sitting room. 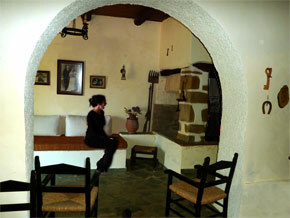 Dimitra features a traditional open fireplace and is full of local historical curios and artefacts. 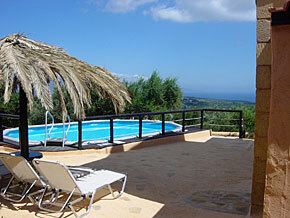 Wonderful views - a perfect location for hiking & climbing or as a base to travel to the whole of the west of the island. Low-cost. Outstanding Value! Two modern, traditionally-styled and beautifully built two-bedroom holiday houses adjoining Chrysanthi, sitting amid beautiful gardens and olive trees overlooking Chania. See Holiday Fun. Very spacious modern accommodation of a very high standard, including two shower-rooms/WC's. Either is ideal for two couples, or a family. Edge-of-village location but close to big-city facilities. Wonderful views. 5 mins to beaches by car, 10 mins to the dynamic, bustling and cosmopolitan city of Chania and all its excitement - but right next to beautiful walks in the hills and valleys, eventually down to the lake and bird sanctuary at Agia. Low-cost. Outstanding Value! Half price car hire with this house! In the unspoilt and fascinating village of Elos, between Kissamos and Elafonisi, two brand-new, two-bedroom stone built luxury holiday villas with air-conditioning and private pools, set amongst huge trees and woodlands. 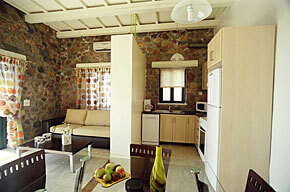 Perfect for a hideaway couple, two couples travelling together, or a small family. Mountain air, tumbling streams, walking, riding and absolute peace. Excellent touring base. This is in fact a huge open-plan luxury studio but the style and the furnishings along with the privacy and independence of the building and its swimming pool, more than justifies the description as a Villa and all that suggests. 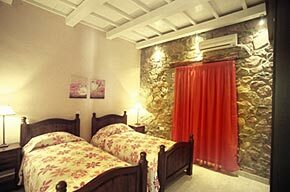 Zo� is situated on the far west coast of Crete, between Fallasarna and Chrisoskalitisa and just ten minutes from the island of Elafonisi - which can be seen from the balcony. 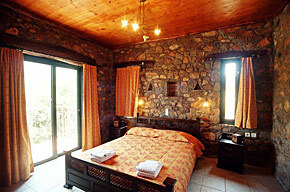 This is our most luxurious and romantic two-person holiday accommodation ever. 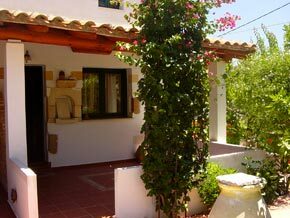 The house is beautifully furnished and appointed, with air-conditioning, satellite television, jacuzzi-style bath - everything! The main features of Zo� are its complete privacy, and blend of romantic modern decor and furnishings with traditional Cretan stone and wood construction. Beautiful! 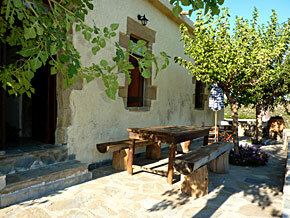 A traditional-style villa on the far west coast of Crete, between Fallasarna and Chrisoskalitisa. 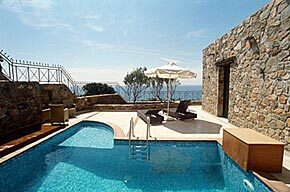 Villa Joanna is one of our more classically beautiful older style villas combining typical rugged Cretan stone and wood construction with a modern fully fitted interior and with fabulous views of the sea and the island of Elafonisi. The villa sits alongside, but is quite separate and screened from, its sister house, Villa Sophia, which is almost identical. These houses are beautifully furnished and appointed, with air-conditioning, satellite television, jacuzzi-style bath - everything! Situated on the far west coast of Crete, between Fallasarna and Chrisoskalitisa, Villa Sophia is a traditional-style house and one of our classically beautiful older villas. Sophia combines typical rugged Cretan stone and wood construction with a modern fully fitted interior with fabulous views of the sea and the island of Elafonisi. The villa sits alongside, but is quite separate and screened from, its sister house, Villa Joanna, which is similar in style and size. The house is beautifully furnished and appointed, with air-conditioning, satellite television, jacuzzi-style bath - everything! This is a new holiday villa on the far west coast of Crete, between Fallasarna and Chrisoskalitisa and just ten minutes from the island of Elafonisi - which can be seen from the balcony. 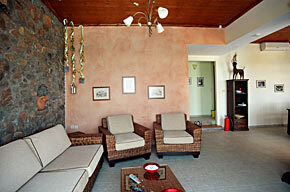 Villa Fillio is one of our most luxurious houses ever with two bedrooms, two bathrooms and TWO swimming pools! The house is beautifully furnished and appointed, with air-conditioning, satellite television, jacuzzi-style bath - everything! The main features of Fillio are its complete privacy, and blend of smart modern decor and furnishings with traditional Cretan stone and wood construction. Magnificent! 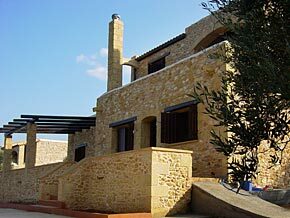 This architect designed traditional stone house is situated just 3 miles inland, high above the coastal village of Maleme, some 15 miles or 25km west of Chania. See Holiday Fun. 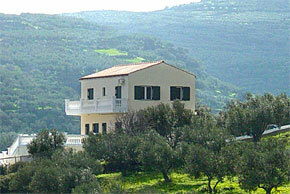 It features spectacular views over the bay of Chania and the goat sanctuary island of Theodoni. 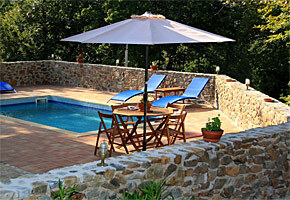 It has a private swimming pool and garden, 3 big double bedrooms and space to comfortably accommodate up to 8 people. This marvellous villa has a large salon/sitting/dining room with open fireplace, luxury fitted kitchen, full air conditioning, and 2 full-size bathrooms. 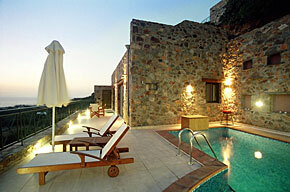 Huge balconies and private sunbathing areas are surrounded by olive trees. Villa Christina, Kastelli, Kissamos 6-10 persons. 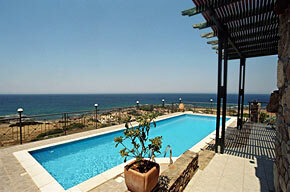 Magnificent luxury Villa overlooking the bay of Kissamos on the road to the Polyrinnia. Up to five bedrooms/bathrooms, luxury sitting/dining room and kitchen. Air conditioning. Huge swimming pool and sun terrace. Available as either three bedroom (two storey) or five bedroom (three storey) accommodation. 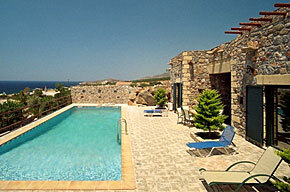 Villa Athin�, near Elafonisi, West Crete 8-10 persons. A spectacularly positioned new four bedroom holiday house constructed with traditional stone and wood and located between Fallasarna and Chrisoskalitisa on the far west coast of Crete - just ten minutes from the island of Elafonisi. 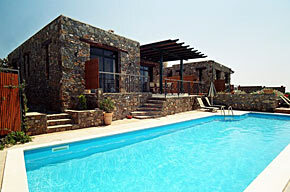 This is a luxury two-storey house on a large hilltop plot overlooking the west coast of Crete. 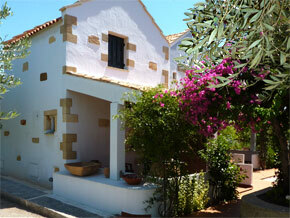 Located on the outskirts of a village and a short walk to the sea. Huge living/dining room, four beautifully designed bedrooms all with en-suite bathrooms and a kitchen fitted with every modern convenience. Air conditioning. Huge terraces and spectacular swimming pool. 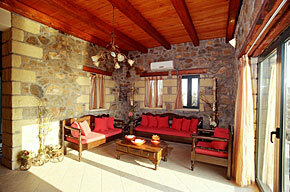 Smart modern decor and furnishings with traditional Cretan stone and wood construction. Spacious luxury.